We are S P Astley Funeral Directors in Denton, and it is our duty to give you a standard of funeral care that is second to none. We are committed to ensuring your loved one’s funeral is personal to you. We will get to know you and all your wishes for your loved one’s funeral, so we can organise a beautiful service which pays homage to their life. Whether you prefer an extravagant celebration of life, a religious or non religious funeral or a contemporary ceremony, we have the expertise to cater to your every need. You can tailor every aspect of the day. No matter how big, small or unique you think your request may be, we will do our best to fulfil all your wishes. If you are short of ideas on how to make the day personal and different, just ask, we can help. You can find our funeral directors on Hyde Road, next to The Angel pub; Denton Methodist Church is also a short walk away. 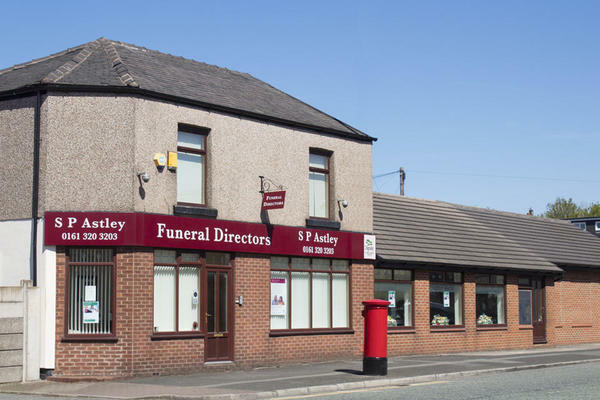 Our funeral home can be easily accessible from the neighbouring towns of Hyde, Dukinfield, Ashton-under-Lyne and Audenshaw; along with Stockport, Manchester and the rest of Tameside. We are here to support and assist you during this difficult time, all you have to do is pick up the phone. Our lines are open 24 hours a day, we can give you advice or answer any questions you may have. Call us today on 0161 320 3203 to talk through your personal requirements. At S P Astley Funeral Directors, we understand how special life is with those that you love. For us, every funeral is unique and personal. We have a service to fulfil every wish, with every detail carried out with the same uncompromising quality of care. From a traditional service, to a colourful woodland burial, your options are limitless with our Full Service Funeral. If you have a little more flexibility when it comes to arrangements, then we can provide a Simple Funeral for a lower cost. There is car parking available at the rear of our funeral home or at the Angel Public House. We are located next to The Angel pub on Hyde Road. We are directly opposite Haughton Hall Road. Our staff are available 24 hours a day on 0161 320 3203 if you require our services outside of these hours.